Today, January 18, is the Confession of St. Peter the Apostle. Confession is a dirty word to many modern people. For today to be called the Confession of St. Peter it almost makes it sound like Peter did something bad. Spoiler alert: he didn't. Liturgical Calendar Joke If he did, the liturgical calendar would surely include the Punishment of St. Peter on January 19. You can check if you want to, but I'm pretty sure it's not there. Okay, I checked. Jan. 19 is Wulfstan. Next week, on January 25, it's the Conversion of St. Paul the Apostle. This is a little bit easier to understand. Everyone knows what a conversion is, even folks who aren't particularly interested in having one. Maybe you've heard of these two fellows in tandem, Peter and Paul. You might even know that they're commemorated together in the liturgical calendar on June 29. The liturgical calendar's linking of these two saints is important and has a great deal to say about the nature of the Church. It's not just June 29 that they appear together. Their two flagship acts, one of confession and one of conversion, complement each other and are commemorated exactly one week apart. Peter's confession is about who Jesus is. When asked "who do you say that I am?" Peter confessed, "you are the Christ" (Matthew 16:15-16). Jesus seems pleased with Peter's response, to put it mildly. While Peter passes this pop quiz with flying colors, Paul, on the other hand, is thrown into a state of confusion. There's a blazing light that knocks him to the ground and then a voice which prompts him to ask the question "who are you, Lord?" (Acts 26:15). These two four-word phrases, "You are the Christ" and "who are you Lord? ", are responsible for the Church as we know it. This can be seen clearly in the architecture of the Cathedral of Saint Peter and Saint Paul in the City and Diocese of Washington. The entrance of this massive building is flanked by two towers, one named for Peter and one named for Paul. Supporting the doorway to Christian worship and Christian life are the two great acts of these saints. And the space inside the Christian Life is filled by those who confess (in the Peter sense) who Jesus is and those who ask who Jesus is. We each must do both. And the Church itself is a space where this activity occurs. They are like the two Great Commandments to the church. "Do you believe in Jesus Christ, the Son of God?…"
"Will you seek and serve Christ in all persons, loving your neighbor as yourself?…"
It's important to note that not even Peter could always confess who Jesus was. He is perhaps better known for his three denials of Jesus than he is for his Confession. But if the Church's very rock can waver we must know that the Church itself is a dynamic space which is supported by this ongoing movement of those who confess (in the Peter sense) and those who ask. It surely exists for both, just as surely as the cathedral entrance in Washington has two immense towers. And just as the National Cathedral proclaims that it is "a house of prayer for all people" so the big-C Church must also strive to live in harmony with itself. At any given point in the life of the greater Christian community there are those who are able to confess who Jesus is and those who are asking the question "who are you"? 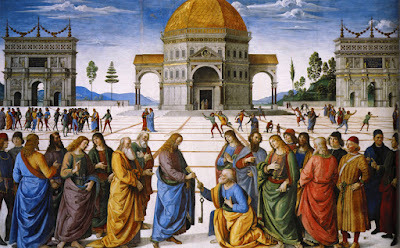 The international ecumenical observance of The Week of Prayer for Christian Unity" is held in the octave between the Confession of St. Peter and the Conversion of St. Paul. The point being, I think, that if the Church as a whole is formed by and for those who confess and those who ask, this same impulse is continually calling all Christians into communion. The liturgy has the power to bring us, relatively unencumbered by social expectations, to a place where we can hear God at the depths of our being. Often people confuse good liturgy with what is sentimental, faddish, or even cute. Good liturgy is more likely to be fearful and make us uncomfortable. Good feelings or a sense of security can often be the very antithesis of effective worship.